Tim Nolan is a senior applications manager for Collin County, Texas. Tim Nolan was mapping out a career as a microbiologist when he took a geography course at a Texas university, and something clicked. More than 25 years later, Nolan is a GIS professional who works as a senior applications manager for Collin County, Texas (north of Dallas). In this interview with Esri writer Karen Richardson, Nolan talks about his change in career path; why he finds attending the Esri User Conference (Esri UC) valuable; and a presentation he hopes to give at the next Esri UC, about an app people can use to find the most convenient voting centers during elections in Collin County. Richardson: What do you do at Collin County? Nolan: I help manage the county’s information technology [IT], records management, and GIS/rural addressing services. I’ve been doing this for the past six years. Before that, I worked as the county’s GIS administrator and GIS database administrator. The Election Polling Place Finder app provides people with directions to voting centers in Collin County. 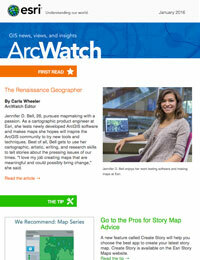 Richardson: How did you get interested in GIS in the first place? Nolan: I was going down the path to a degree in microbiology but wasn’t really convinced that I wanted to do that for the rest of my life. I’d always loved geography. My dad worked for an airline, so we flew everywhere, and I’d take the window seat to see the landscape. I didn’t realize you could make a career out of geography until I got to college, when I took a human geography class. That class just clicked. I changed direction and took as many geography classes as I could. This was back in 1989, before the renaissance of GIS and environmental science. I took the very first GIS class that was ever offered at my university, and a light bulb went on for me. I knew that once I graduated, I had to find a place to work that did this GIS stuff. Richardson: Is that when you started working at Collin County? Nolan: No, actually, I started at the City of Arlington [Texas] as a plot boy, taking plotting requests and basically making sure the black ink didn’t run out when the city was making a hard-copy map. This was back in the day when it took two hours to make one map. It was fascinating to watch, but I knew that it wasn’t the GIS work I really wanted to do. While I was there, Collin County was just launching its GIS system and needed someone to run it. I applied for the job, after just four months’ experience being a plot boy, and I was hired soon after. There weren’t a lot of people to choose from back then! Years later, I asked if they had picked the wrong resume—maybe they meant to call Norton but instead called Nolan. But no, I was the one they picked. My first day of work, I was literally pulling stuff out of boxes—our UNIX station and boxes of [Esri] ArcInfo media to install software. The rest, as they say, is history. 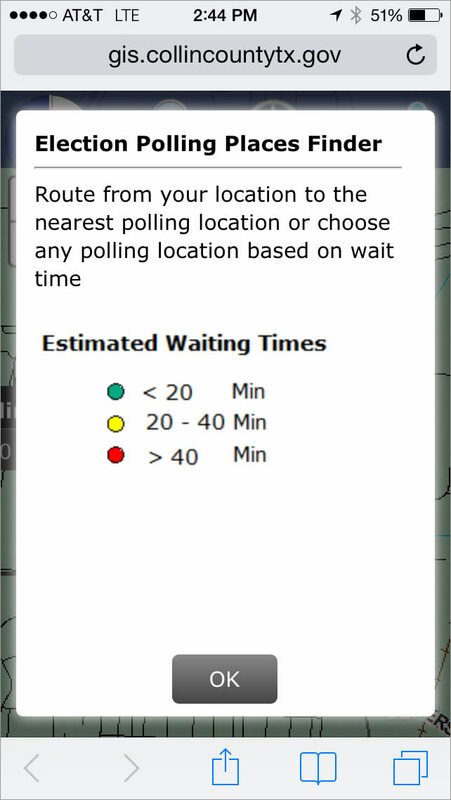 The app shows real-time wait times at the voting centers throughout Collin County. Richardson: Tell me a little bit about the project you discussed in the paper abstract you submitted for consideration as a presentation at the Esri UC. Nolan: Collin County uses Voting Centers, which allow residents to cast their vote anywhere in the county instead of just one designated polling center in their voting precinct. While that helps alleviate some waiting lines at popular polling stations, we wanted to find a way to help expedite voting and make the experience the best it could be. We needed to find a way to let voters know that there were other voting stations they could go to if the one they chose was busy. But we had to do this carefully, since it is in violation of voter laws to send people away from a polling station even if, in the long run, it will help the voter out. To solve this problem, we placed quick response [QR] codes at the polling stations that voters can scan with their smartphones. 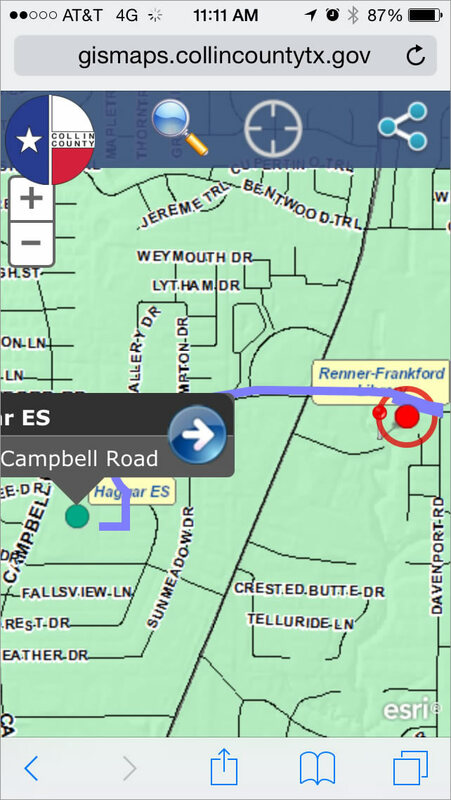 This will display a map on the voter’s phone, using our Election Polling Place mapping app. The app shows where the closest polling stations are located and the approximate wait time at each location. Voters can then choose for themselves whether they want to leave the station they are at and go to another location with a shorter line. Nolan: Well, we had one problem: a history of server downtime that interrupted online services for our citizens. Long line at one polling location? No problem. 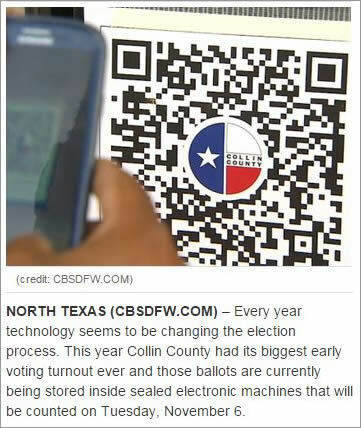 Voters can use their smartphones to scan quick response (QR) codes posted at the voting centers to find alternate polling locations nearby and get the approximate wait times. Nolan: To prepare for a big election on Tuesday, November 4, 2014, we implemented Esri’s Polling Locator template with updates from our services provider, Esri partner GISi. This app is part of the ArcGIS for Local Government solution. It was easy to customize and a lot more lightweight on the server than a previous application we had been using. This turned out to be very important. In comparison to past elections, we had zero server reboots over a 24-hour period, even with over 170,000 total page views, 19,000 visits to the Election Polling Place mapping app, and almost 27,000 routes generated from the app. Richardson: Sounds like a resounding success! Nolan: Yes, our website had three times the daily usage with this mobile app, and 54 percent of that traffic was election related. The app was simple to use and gave voters the flexibility to not only locate the voting center nearest to them but also find the one with the shortest wait time to vote, from any computer or mobile device. We were able to direct people to voting centers that were most convenient to them. For example, people could vote near [their workplace] instead of voting at their traditional polling location near their home. And the data gathered from this mobile app will help us learn about voting trends in the area. These abilities are something that we have not seen in any other system. 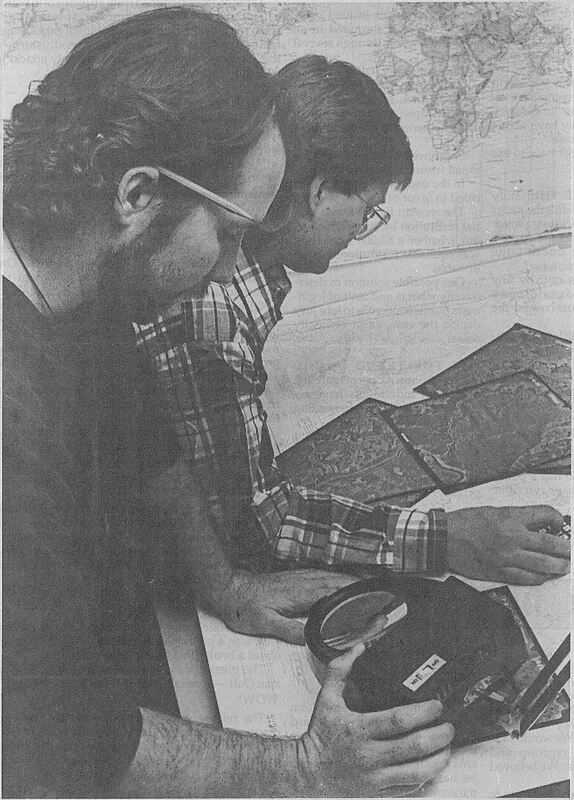 Tim Nolan (right) and Steve Korzekwa work as GIS interns at the University of North Texas about 25 years ago. We even received the Best Application Serving the Public Award from the Best of Texas in 2014. 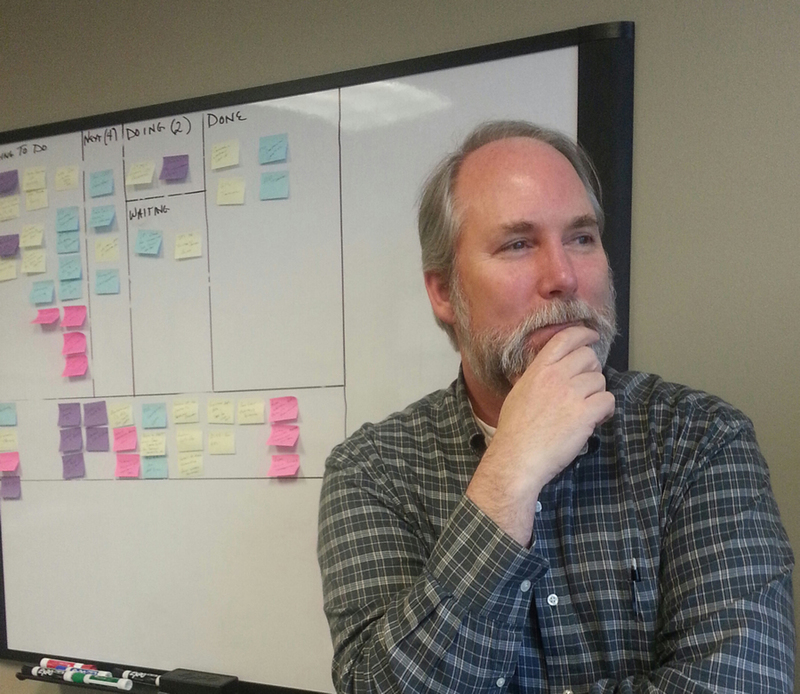 Richardson: Why do you like working with Esri software? Nolan: Esri software is kind of the de facto standard in state and local government all over the world. It’s so easy to connect with other users if you have a question. The cities within Collin County are all using Esri GIS, and we have created a great community of support. Richardson: What has kept you at Collin County? Nolan: Collin County has always been ahead of [its] time. From day one, GIS was a part of the IT department, which was quite unique back then. It makes sense to have the technology in an umbrella organization like IT, because everyone can engage in developing services and applications and we can equally serve multiple departments. Richardson: We are happy to hear that you have attended the Esri UC for the past couple decades! What keeps you coming back? Nolan: The county has always had an education and training budget. For the past 23 years, we have used this budget to send our staff to the Esri UC. I have found taking a class here and there is great, but nothing is better than going to the [Esri] UC and meeting your colleagues and the folks developing the Esri software. The only other conference we make sure we never miss is our local Esri user group meeting—it’s like a mini Esri UC. We’ve found both of these conferences [to be] just too valuable to miss.